Everybody loves a scapegoat. 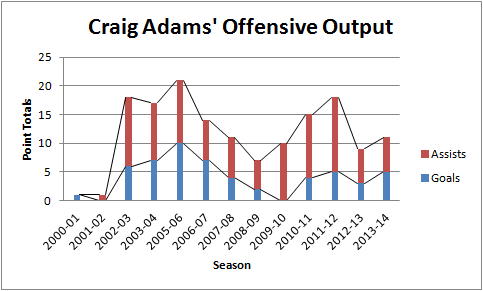 This season, the early favorite to play that role is one Craig Adams. And why not? Craig Adams will not score 10 goals. He's only done that once in his career, in the 2005-06 season which he spent in Carolina. Nor will he put up 25 points. He's never done that. But this is Pittsburgh. And putting up points is the only way fans measure the worth of a forward. What you get with Craig Adams offfensively. With the departures of Derek Engelland and Tanner Glass, the focus of negativity this season has fallen squarely on the shoulders of Adams, and to a lesser degree his linemate Zach Sill. Adams gets the worst of the criticism, however, because he is the long-time veteran. He's the one with grey in his beard and is much closer to the end of his career than he is to the peak of it. 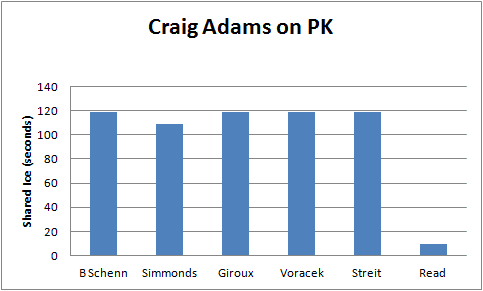 As much as modern day social media "personalities" know - or at least claim to know - about hockey, their singular focus on bashing Craig Adams tends to revolve around one stat: his Corsi. Case in point, last week's loss to Philadelphia, and the lackluster performance put in by almost the entirety of the Penguins' lineup was a secondary story to Craig Adams and his 0 Corsi-For, 7 Corsi-Against rating. Ignored is the fact that the Flyers have owned Pittsburgh at Consol, regardless of Craig Adams' performance against that team. We're also more than willing to ignore the fact that Adams, in the midst of "earning" his negative-7 Corsi, did so primarily while killing penalties. In situations where a team is down a man, the goal is to weather the storm and survive. Against Philadelphia's top power play unit, Craig Adams did exactly what was necessary to accomplish that. The result: a negative-5 Corsi for the 37 year old winger during his 1:59 of penalty killing duties. Granted, linemate Marcel Goc finished the game with a goal, scoring late to bring the Pens to within one in the third period, but he finished with a plus-2/minus-10 Corsi. Those two pluses? They came along Nick Spaling, Blake Comeau and Steve Downie. What do each of those players have in common? They're newcomers and likely haven't bought into the "Flyer Yips" that many of the rest of the Penguins lineup has suffered from since moving to Consol. But look at the 2 shots against the Pens while Craig Adams and you'll find a 49-foot slap shot which was easily saved and a 39-foot wrister that never had a chance. Even the shots taken during the Flyers' time on the power play were not dangerous by any stretch: a 33-foot snap shot, 30-foot wrister that completely missed the net and a 55-foot slap shot. The only remotely dangerous shot sent Marc-Andre Fleury's way when Craig Adams was on the ice came off of Wayne Simmonds' stick from 13 feet. 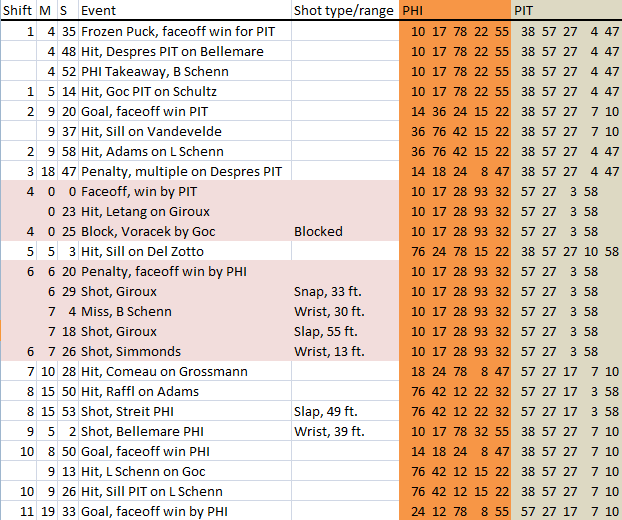 As Lyle Kossis of Pensburgh pointed out, shot distance is indeed a contributing factor in team defensive performance. What is Corsi-Against if not a defensive measurement? Nevermind that Adams played the entire night solely as either a 4th line winger or a penalty killer. Goc, on the other hand, got 3rd line minutes. Everything that happened with Adams on the ice. 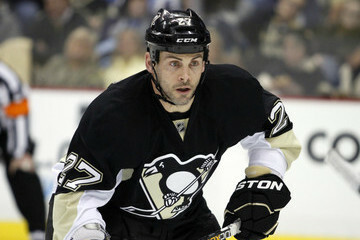 The fact that the Penguins lost to the Flyers - yet again - was not due to the play of Craig Adams. Rather the entire team was struggling getting through the neutral zone, a result of the Flyers' clogging up the neutral zone. They choked off the Pens attack before it began. And they did it throughout the entire night to the entire team. But advanced stats don't care about any of that. It turns out that the social media masses don't care either, provided it gives them more ammo to rip on a player they're not necessarily a fan of. Bring up the fact that Sidney Crosby finished last season not only with the Hart Trophy, but the 139th highest Corsi rating among all skaters with more than 300 minutes, and you're met with a "Yeah, well....". At some point in hockey over the past few years, Corsi has taken over as the end-all be-all of the stats world. The problem is that Corsi, when used properly, tells us very little about individual players. However, judging by the hockey commentary on various mediums, it tells us everything we need to know abou the players. I'm not bashing Corsi, because it does have its place. It simply is not a stat that is a function of a single, individual player. Yes, individuals impact the stat. But there are 12 on-ice individuals that contribute. Two coaching staffs that contribute, albeit indirectly. The game situation itself impacts that rating. Referees impact it. Broken sticks impact it. Corsi is only relative to situations that are exactly the same. It only measures the effectiveness of six specific players versus another six specific players in a specific situation at a specific point in a specific game. 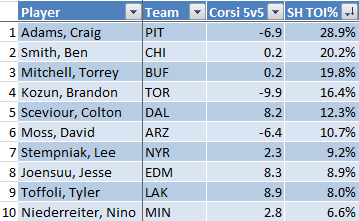 As an individual player statistic, Corsi should be considered as relevant as Plus/Minus rating. It just takes longer to figure out. Comparing Adams' Relative 5-on-5 Corsi to other 4th line right wingers, you find that he is near the bottom. Only Brandon Kozun (TOR), Jared Boll (CBJ), Tim Jackman (ANA) and Linden Vey (VAN) have lower numbers in that department. However, of the 30 players occupying that 4th line RW position, it is clear that Craig Adams' value to the Penguins is in his defensive capabilities as opposed to his offense based on the ratio of time he spends on the ice in penalty killing situations versus at even strength. Adams is a stalwart presence for the penalty kill and his detractors will refuse to give him credit for that. They will cite the struggles of the team's penalty kill throughout this early stage of the season. Yet, while the penalty kill units have surrendered 6 goals in 28 shorthanded series, Adams has been on the ice for just one of those. And in that particular sequence, he did exactly what he was supposed to do. The lone PP goal allowed with Adams on duty. As my PensInitiative colleague, Michael Traeger, pointed out in a conversation that we had about this very topic, hockey is a contextual sport and Corsi is simply not a contextual stat when applied to a single player. And it certainly doesn't reflect upon the role a player fills on a team. Anybody who has taken a math, statistics or science class at the college level realizes that the more variables you add to any mechanism, the less likely it is that you can accurately gauge or predict a single piece's impact. Every variable is affected by every other variable in that system. Corsi simply does not account for all that goes on in a single shift, let alone an entire hockey game. Fans, bloggers and radio hosts can complain about Craig Adams' non-plus night all they want, but in the end, he played his role that night. As he does most other nights, for that matter. But aging role players have no place - regardless of their effectiveness - in the hearts of the fans of a team with superstar talent.